The Binkerton siblings are not new to these adventures. They are very exciting to go on. 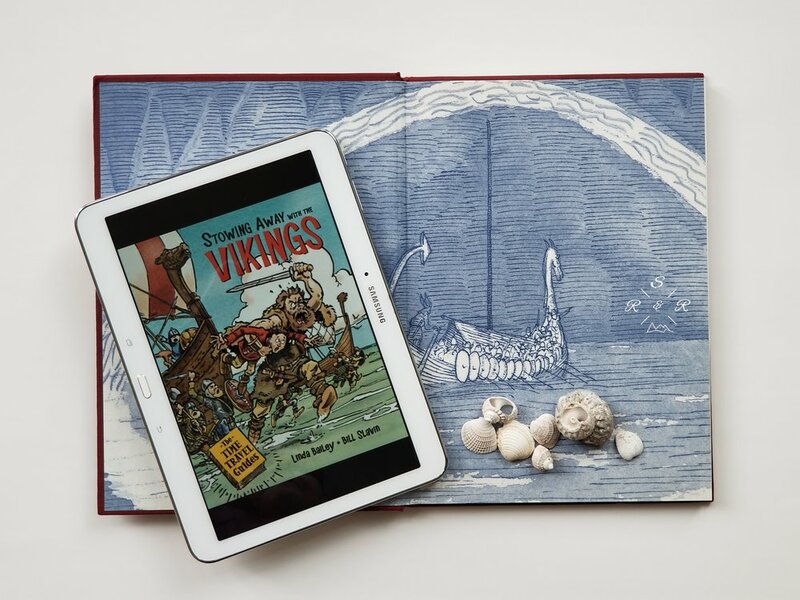 So when little Libby, the youngest of them, leans against the travel agency door, it opens right up and Julian Pettigrew, the owner, bestows them with a Vikings travel guide. And before they know it, they are on their way…smack dab into the midst of Scandinavia and the life of the Vikings. As usual, Josh, Emma and Libby experience their stay by getting into the best and worst of troubles. How will they escape this time? This series is great for Kindergarteners or elementary students. It is a gentle “get to know new old places” introduction. While following theses siblings and their shenanigans it adds to the thread that keeps kids going without the burden or their realization that they are learning. Most of the pages contain an excerpt of two pages from their travel guide with factual information at the bottom. So the reader can partake in the siblings’ story as well as grab immediate info bites about the situation. As with any of the other books in the series, the reader is informed about the place and time period traveled to, the way people lived and worked at that place in time, and any significant information with more specifics. In this case Viking raids, games, travel etc. At the end of the book are a few extra pages with further information and sources listed to dig into. I received a digital copy of this book from NetGalley in exchange for an honest review. All opinions are my own. Thank you kindly.